[caption id="" align="alignright" width="240" caption="Fall color in Appalachia."] 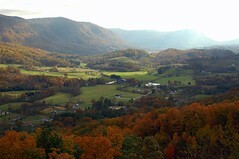 [/caption] Virginia's western border is mountainous, for the Appalachian Mountains stretch from Pennsylvania to Tennessee. The Appalachians include the Blue Ridge Mountains, the Allegheny Mountains along the West Virginia border, the Shenandoah Mountains stretching north, and even the Great Smoky Mountains, along the border with Tennessee. No matter what you call them, they are beautiful, and share the wonderful, rich culture and history of Appalachia. If time permits, take your time while traveling through this part of the state. Plan to stay in more than one Virginia Mountains bed and breakfast between Winchester and Norton. You've heard of "island time"? Well, it's time to experience "mountain time" - though there is no need to adjust your clocks. Keep an eye open and an ear tuned to local festivals as you travel the region throughout the year. The Chilhowie Community Apple Festival, in southwest Virginia, has been a tradition for over 50 years. Stop by for the parade, live music, and apple butter (watch it made). Nearby, the Whitetop Mountain festival features fiddling and a Ramp Eating Contest - not the ramp you drive on, but the local wild leek. And the Virginia Mountain Music Festival will keep your toes tapping. Up north in Shenandoah County, the Shenandoah Valley Music Festival is one of the most established music festivals in the Mid-Atlantic Region. If you enjoy outdoor recreation, you'll be thrilled by the breadth of opportunities available in the Virginia Mountains. Scenic drives through the Appalachian Mountains - along the Blue Ridge Parkway and the Skyline Drive - reveal one trailhead after another. Hike to Hogback Overlook, Humpback Rocks, or along the Apple Orchard Falls Trail to Petites Gap. You can thoroughly plan your itinerary, or be more whimsical, asking the innkeepers at various Virginia Mountains bed and breakfasts for suggestions as you go. The mountains of Virginia are lovely any time of year, in the heat of summer, dressed in fall colors, blanketed in snow or when coming back to life in the spring. Travel here as soon as you can, and return again and again.